Sumptuary laws were enacted in many centuries and countries. 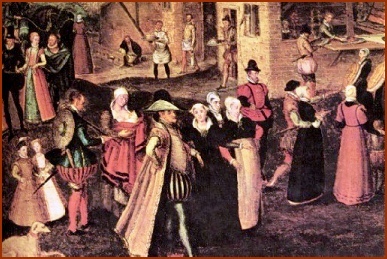 In Elizabethan England, these laws attempted to restrict the sumptuousness of dress in order to curb extravagance, protect fortunes, and make clear the necessary and appropriate distinctions between levels of society. The principal concern was that money spent on frivolous display would be better spent on the state of more important things, such as horses, critical to a society always in peril of the neighbors. The other concern was that letting anyone wear just anything must lead inexorably to moral decline. If you couldn't tell a milkmaid from a countess at a glance, the very fabric of society might unravel. These statues were almost impossible to enforce and were essentially a lost cause. There were no "costume police". It is most unlikely that any yeoman's ambitious son in a new sugarloaf hat ever found himself stopped on the street by a constable zealously performing his duty, and be carted off to the magistrate. If your neighbor complained, there might be some action, a warning and possibly a fine. The fine, however, was a penalty, not a license fee. You could not buy a license to wear something above your station. And you could always turn the tables on your neighbor another time. According to some sources, young gallants entering London could be stopped to have their swords measured and, if too long, broken. If you appeared at Court in a ridiculous ruff, it's unlikely you would be sent to the Tower. But if the Queen decided to point and laugh, you could kiss your career goodbye. That is, June 1574, the 16th year of the reign of Elizabeth I. The Queen's Accession Day is in November, hence the years of her reign are counted from November. Elizabethan lawmakers, much like modern ones, had no notion of paragraphing. I have provided paragraph breaks and attempted to simplify some diction in the interest of clarity. For the most part, however, only spelling and punctuation have been modernized.